A new book by conservancy scientists Eddie Game and Craig Groves gives conservation planners the tools they need to combine the where and how of conservation into a single approach. Eddie Game has worked on conservation projects in more than 15 countries, applying innovative methods and analyses to community protected areas in the Solomon Islands, grazing management in northern Kenya, and catchment restoration in Colombia. Craig Groves is the executive director for the Science for and Nature and People partnership (SNAP). 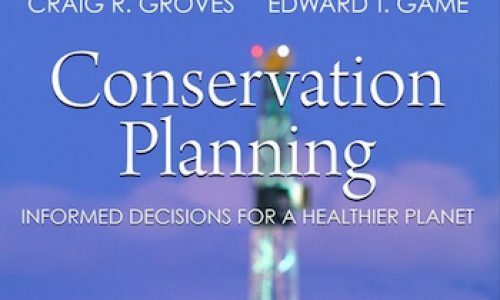 In their book “Conservation Planning: Informed Decisions for a Healthier Planet”, they give conservation planners the tools they need to combine the where and how of conservation into a single approach. Conserving nature can be a complicated business whether in an urban environment, a production landscape dominated by agriculture or forestry, or more natural environments. Conservation planning draws on a wide range of disciplines and literature from conservation biology, landscape architecture, and land-use planning to decision science, natural resource economics, and sustainability. The authors have combined the fields of spatial planning (establishing priority places for conservation) and strategic planning into one overall planning approach. The book’s underlying philosophy is that effective planning is really about making tough choices of where to allocate resources to achieve the conservation outcomes of a project, program, or conservation initiative. Read an interview with the authors on Cool Green Science.